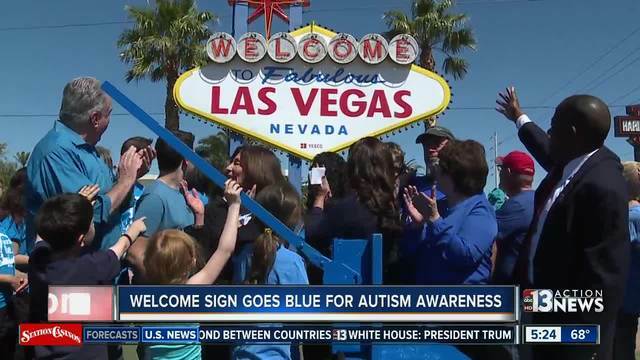 Clark County Commissioners and representatives from several local organizations supporting autism awareness came together Monday to turn the Welcome to Fabulous Las Vegas sign blue in support of Autism Awareness Month. Clark County Commissioners and representatives from several local organizations supporting autism awareness came together Monday to turn the “Welcome to Fabulous Las Vegas” sign blue in support of Autism Awareness Month. The participating organizations included the Touro University Nevada Center for Autism and Developmental Disabilities, Families for Effective Autism Treatment and the Grant a Gift Autism Foundation. County Commissioners and representatives from the groups promoting autism awareness turned on blue light bulbs installed on the “Welcome” sign during a brief ceremony. The light bulbs, which are usually yellow, surround the border of the sign.